The following article is reprinted from the Journal of the Barber Coin Collectors' Society, Volume 13, Number 3. The following article may be printed and distributed freely, as long as the reference to the Barber Coin Collectors' Society is included. 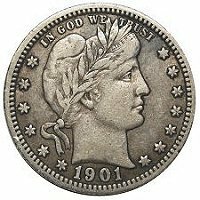 As most collectors of Barber Quarters know, the 1901-S is the key of the series in all grades. As such, it is subject to frequent counterfeiting, more in fact than any other Barber coin. Where else can one turn a $2 coin into a $3000 rarity simply by adding a mintmark? I offer two different types of thoughts and observations about counterfeits of this great rarity. In more than a dozen years actively searching for Barber Quarters, I agree with the sentiment that in low grades (G-VG), there are actually more fake 1901-S quarters out there than genuine coins. While most fakes are the “added S” type, I’ve seen others that involved using a 1901 obverse, coupled with a common S-mint reverse, the two halves muled together to form a fake. A coin like this, if one only examines the mintmark for monkey business, will pass the test. One dealer I know who was fooled by this said he was sure the mintmark had not been added, so he bought it for $1500. When the coin was removed from the 2x2, we both clearly saw the seam on the reeded edge where the two halves were joined together. The mintmark had not, indeed, been added, but it was still an expensive mistake. Yet another fake I saw recently was a G-VG with an added S – and the S was sharp and clear and looked like it belonged on a VF! This should have been a warning sign. Only two pairs of dies were used to strike the 1901-S quarter. Both have distinct date and mintmark positions, along with a few other diagnostics. An excellent reference exists describing these two dies, along with photos of both genuine die pairs. If you collect Barber Quarters, the Complete Guide to Barber Quarters, 2nd Edition, by David Lawrence, is a must. 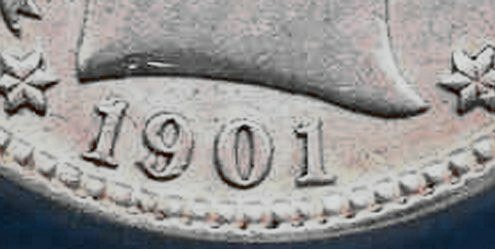 Simply examining the date position will detect most of the existing fakes, without even looking at the reverse or the mintmark. One factor about Dave’s book is that the photos of the genuine dies are of high-grade coins. However, most available coins are in low grades, and the coins’ elements typically get somewhat mushy as the coins wear. To aid in the authentication of G-VG specimens (the grades of most fakes), I offer photographs of the two genuine dies, both from coins in this lower grade range, using descriptions and terms from Dave’s Complete Guide book. Obverse A: Both 1’s centered over a dentil, second 1 is high and close to the base of the bust. Reverse A: S is low, slightly closer to R than D, and is slightly tilted to the left. 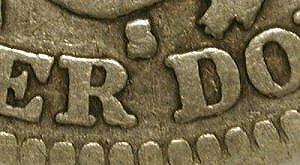 Obverse B: Both 1’s are centered over the gap between dentils, second 1 is lower and not close to the bust. Reverse B: S is higher, centered, and more upright. Note that it looks like it belongs on a VG coin. 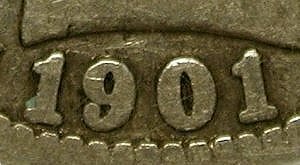 Most fakes are easily identified based on date position, but recent years have resulted in the discovery of a 1901-P obverse die that is similar (but not identical) to 1901-S Obverse B, and potential fakes may be very close. Twice, I saw a coin that almost seemed to match the technical description of one of the dies, but just didn’t look quite right. Only observing numerous genuine coins will give you the ability to know a fake when you see one, with confidence. The past year was amazing to me, because it produced the appearance of at least three high grade (XF-level) counterfeits in a relatively short period of time. Why this is so puzzling (to me, at least!) is that with the high value of XF specimens, one would expect any high-grade 1901-S quarter to be under extreme scrutiny before being traded. And Dave’s excellent reference has high-grade photos of the only two genuine die pairs. These XF fakes were certainly three different coins, and all had been cleaned on both sides. The first two of them (the first appeared at the Atlanta ANA show) had an added S. They were also both of extremely poor quality, with the solder being clearly visible under the lowest magnification -- one had a black circle of solder under the mintmark visible without magnification! However, these coins actually fooled coin dealers. There is really no excuse for high-grade fakes to pass through like this. A third coin, XF/AU, was seen by another collector I know, who had purchased it by mail. He thought it was a fake as soon as he saw it (it did not match either genuine obverse die), but as he had not seen many genuine coins, he wasn’t quite sure. As a prerequisite for his buying it, he sent it to ANACS where they confirmed it was fraudulent. Based on the description he gave to me over the phone, I believe it was a different coin from either of the first two that I saw. As I did not personally examine the coin, I don’t know what type of alteration was performed, but clearly the forgery was nowhere near as obvious as the other two. 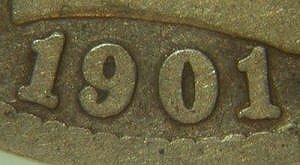 Perhaps most alarming of all, this summer, an on-line sale had a certified 1901-S “AU, cleaned scratched” that was in a slab. It was also a fake. Its date position clearly did not match either of the two genuine dies. It was not even close. You can compare the photo from the Internet (below) with Dave’s book, or with those photos above. I notified the seller, but do not know what happened with the coin [2004 Update: the coin had sold, but was later returned when discovered to be fake]. Watch out for this coin, or those like it. By the way, the grading service involved was NOT one of the ones that guarantee their work (PCGS, NGC, ANACS, ICG). I’ll say no more, except that it pays to use services that offer guarantees on their work. You will note that the first 1 is centered over the dentil, but the second 1 is centered over the gap between dentils, and is much too low. Bogus! I do not know if this coin is different from the third specimen mentioned earlier, as I did not see either coin personally. This certified counterfeit is not one of the first two I saw late last year. Has anyone else noticed a flurry of higher-grade fakes? Has anyone else heard of so many before? Again, due to the high value, it is amazing to me that high-grade specimens trade so freely without due diligence in determining authenticity, especially by the dealers who bought them. Counterfeit 1901-S quarters continue to make life difficult for the collector who may spend years trying to find a decent example. 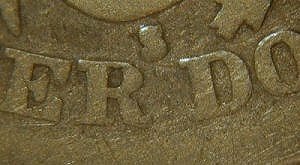 In lower grades, fakes outnumber genuine coins, and even high grades are not exempt from forgery. Perhaps the biggest danger when buying one is that people want the coin to be genuine (because they’ve been looking so long), that they can talk themselves into the notion that the coin is probably OK, when it is so easy to detect the vast majority of fakes. One recommendation that I can offer is look at all specimens you see at coin shows, even those well out of your price range. Become familiar with what the two genuine dies look like, and you will less likely be fooled in the future when you do encounter the one you really want. A counterfeit is not a bargain at any price! If you have any comments or have seen other high-grade fakes, feel free to send us email at BCCS@BarberCoins.org.